Dozens of mayors from around the world converged on Israel this week for the 30th annual Mayors' Conference in Jerusalem. 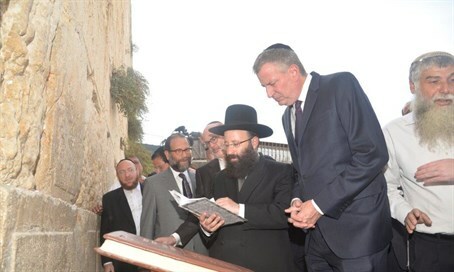 Dozens of mayors from around the world have converged on Israel for the 30th annual Mayors Conference in Jerusalem, and while most of the attention has been focused on Mayor Bill de Blasio – since, of course, he is mayor of one of the world's most influential cities – he is not alone in visiting Israel this week. During their visit to Israel, the mayors will meet with senior political and defense figures, as well as meet with counterparts from Israeli cities, especially those that they are “twinned” with. The mayors will meet with Prime Minister Binyamin Netanyahu, President Reuven Rivlin, Jerusalem Mayor Nir Barkat, Tel Aviv Mayor Ron Huldai, Haifa Mayor Yona Yahav, as well as many of Israel’s leaders in urban innovation. The delegation will also get a taste of the "Start-Up Nation" when they meet with Jewish and Arab leaders of successful Israeli tech hubs. They will visit SOSA, a community comprised of leaders from all walks of the entrepreneurial ecosystem, the Yokneam Innovation Center, a new urban innovation center promoting co-existence between Arabs and Israelis, as well as Babcom Centers, a large call-center initiative in the Galilee whose purpose is to assist Arab men and women to integrate into the job market. The nearly 40 participating mayors include: Mayor Rudrah Singh Tamang of Katmandu, Nepal; Mayor Swati Godbole of Jabalpur, India; Mayor Mauricio Esteban Rodas Espinel of Quito, Ecuador; Mayor Lovelly Warren of Rochester, New York (USA); Mayor Setti Warren of Newton, Massachusetts (USA); Mayor Robert L. Crowell of Carson City, Nevada (USA); Mayor Roland Ries of Strasbourg, France; Mayor László Papp of Debrecen, Hungary; Deputy Mayor Lu Kai of Xian, China; Mayor Remigijus Šimašius of Vilna, Lithuania; Mayor Anabela Freitas of Tomar, Portugal; Mayor Siniša Mali of Belgrade, Serbia; Mayor Lake Ayalew of Bahid Dar, Ethiopia; Mayor Krzysztof Żuk of Lublin, Poland; Mayor Gaspar Soares‬ of Dili, East Timor; and Mayor Andres Jafif of Punte del Este, Uruguay.